When I was in college (many, many moons ago), programs in scientific studies had just started branching out past your basic chemistry, biology, marine biology and pre-med. Today, I'm always shocked and impressed when I see the wide variety of courses being offered by universities. Not just classes on the environment, but classes on how to preserve the environment and plan for the future. One professor who is leading the way in courses on conservation is Tom Daniels of the University of Pennsylvanua. Daniels directs the concentration in Land Use and Environmental Planning and administers the Certificate in Land Preservation. I recently had the opportunity to ask Tom Daniels about his career and what peaked his interested in the environment and conservation, specifically private land conservation. Daniels spent his summers between college working at a former Vanderbilt estate in Vermont called Shelburne Farms. He worked in a 2-acre organic vegetable garden and assisted in the dairy farm operation. The farm was under a lot of development pressure and the property taxes were very high. It occurred to him that the family may have trouble holding onto the beautiful property. He is happy to report that the family operates Shelburne Farms as a non-profit educational organization, teaching children and adults about agriculture and the environment. Daniels then went on to study agricultural economics at the University of Newcastle in England and at Oregon State University. 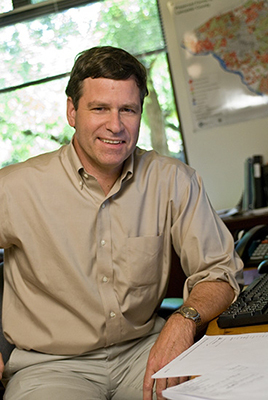 He went into teaching land use planning at Iowa State and Kansas State Universities. Then for nine years, Daniels managed the farmland preservation program in Lancaster County, Pennsylvania, where there is now more preserved farmland (about 110,000 acres) than any other county in America. Daniels feels so strongly about the importance of farmland conservation that he wrote a book on it! A lawyer, who served on the Trust and Estate Law section of the American Bar Association, first approached Daniels about the project. She said that the Committee wanted a book on the law of farmland preservation and asked if Daniels would take on the challenge. So he did, along with his co-author, John Keene. Keene graduated from Harvard Law School and taught for 50 years in the department of city and regional planning at Penn. 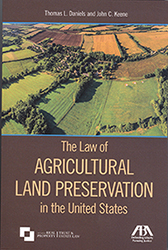 The book is titled The Law of Agricultural Land Preservation in the United States. Conservation easements are a wonderful way to preserve farmland and keep it in the family or make it available for others to use. But it’s a big decision and all options must be weighed. Daniels recommends discussing any kind of decision with the whole family, as most farms and ranches are passed down through the generations. How would a conservation easement fit with the family’s goals for the land? Are there any children or relatives who would be interested in taking over the farm or ranch? These are the types of questions to ask. Daniels also urges anyone considering a conservation easement to contact a land trust that has experience in preserving farms or ranches, or a county or state government farmland preservation program. Be on the lookout for The Law of Agricultural Land Preservation in the United States, a must have for any attorney advising landowner clients and for land trusts and government programs that preserve farmland.